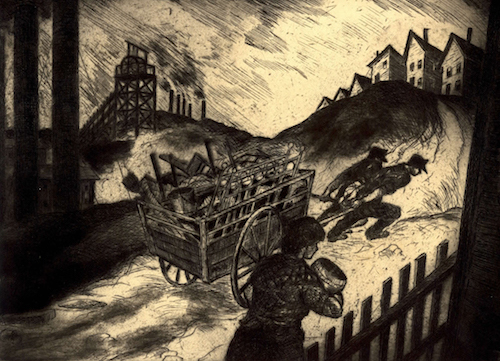 "Noted for scenes of the city life and the Pennsylvania coal mining region, Michael J. Gallagher was director of the Philadelphia Works Progress Administration’s Printmaking Workshop. There, with Dox Thrash and Hugh Mesibov, he was instrumental in the development of a new intaglio process, the carborundum print. Work by Michael J. Gallagher is in the permanent collections the Smithsonian Institution, Washington, Dc, the Metropolitan Museum of Art, NY, the New York Public Library, the Brooklyn Museum of Art, the Art Institute of Chicago, the Los Angeles County Museum of art, the Philadelphia Museum of Art, and the Philadelphia Public Library, the Everhart Museum, Scranton, and Princeton University, Museum, New Jersey."